PM meets with IMF Resident Representative, who spoke highly of government efforts to date. Prime Minister Nguyen Xuan Phuc met with Mr. Jonathan Dunn, IMF Resident Representative in Vietnam, yesterday, where the latter hailed the government’s efforts in keeping the macro-economy and forex rate stable and restructuring State-owned enterprises (SOEs), and especially its support for small and medium-sized enterprises and the private sector. “The IMF has appraised the nation’s reform programs, such as SOE restructuring, and its economic growth of 6 per cent in the context of a number of challenges in the global economy,” he said. He suggested the government continue the work in the new period, in particular stabilizing the macro-economy, controlling public debt, supporting the development of the private sector, and SOE restructuring. The IMF will closely partner Vietnamese agencies to provide advice on macro-economic policy, helping to guide local economic development. Prime Minister Phuc hailed the effective assistance of the IMF to the country’s socioeconomic development process, especially in terms of finance-banking, public debt, and reforming SOEs. The PM said the government is fine-tuning its apparatus and improving the business environment with the issuance of a resolution on major tasks and solutions to implementing socioeconomic plans and State budget estimates for 2016. He told Mr. Dunn about Vietnam’s determination to achieve 6.7 per cent economic growth this year. He hopes to receive more macro-economic policy advice from the IMF in the time ahead. 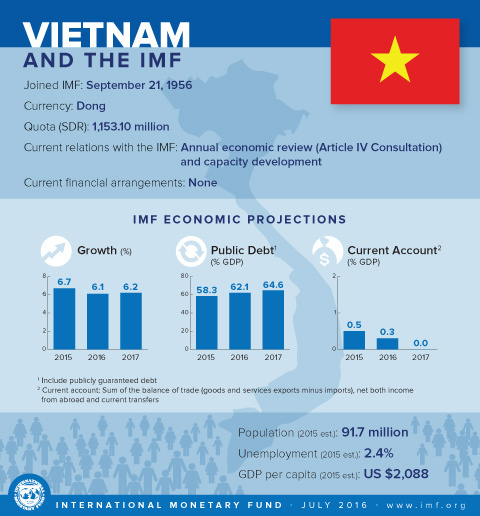 In late June the Executive Board of IMF concluded the 2016 Article IV consultation with Vietnam. For 2016, the economy’s headline inflation rate is projected to rise modestly. Reserves are expected to increase to around two months of imports and public debt to reach around 62 per cent of GDP, according to IMF analysts. The IMF reported that Vietnam’s economy has experienced solid growth with low inflation, reflecting policy attention to maintaining macro-economic stability. Economic performance was robust through most of 2015, driven by rapid export growth, foreign direct investment (FDI), and strong domestic demand. Manufacturing and exports moderated near year-end - reflecting slowing external demand - and agriculture production fell sharply at the beginning of 2016 owing to a severe drought and arable land salinity. Fiscal policy has been loose in recent years. The deficit was 5.9 per cent of GDP last year. Revenues rose strongly, reflecting tax and non-tax collection, while expenditure was higher than planned, owing to carry-forward spending by local governments, and higher capital, social and interest spending. 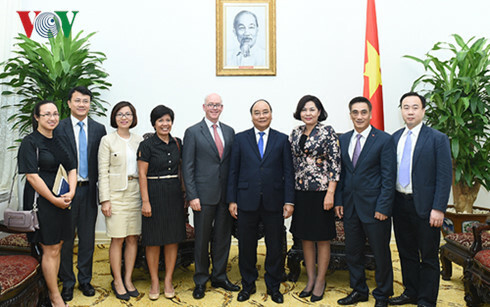 Executive Directors commended Vietnam’s recent good macro-economic performance and the significant progress made in achieving the Millennium Development Goals. They were encouraged by the broadly favorable economic outlook but noted that external and domestic risks exist, mainly from rising public debt, rapid credit growth, and slow banking sector reform. They welcomed authorities’ commitment to prudent policies and reforms and emphasized that determined steps are needed to build on the current achievements and boost the economy’s growth potential.